Brutal is a strong word. But in some instances it can mean aggressive and serious and capable. I guess if you filled an empty BiPro jar with cement and rocks and poked nails out of the sides, and then put it at the end of a 9 foot long chain, and then put a handle on the other end and swung the BiPro jar around like Kratos from God of War, then, yes I suppose BiPro would look ‘brutal’ in the positive interpretation. WHAT? Just alright?? Yeah. Just alright. BiPro isn’t going to knock your socks off. It’s just alright. Really. I had it twice now. The first time I mixed it into water, and the second into milk. The water shake was like…not a sour grapes face, but I was definitely not beaming from ear to ear after each sip like the chick in the Folgers commercial. It was just drinkable in water. Not bad, but certainly not great. In whole milk, BiPro Whey Isolate becomes much more pleasant, even crossing over into enjoyable. I’m still reaching for something like Apollo Pure Protein every time over this one, but, yeah. It’s not so bad. Keep in mind I’ve never been crazy about strawberry flavored proteins too. I give it a B minus. Let’s talk formulation now. 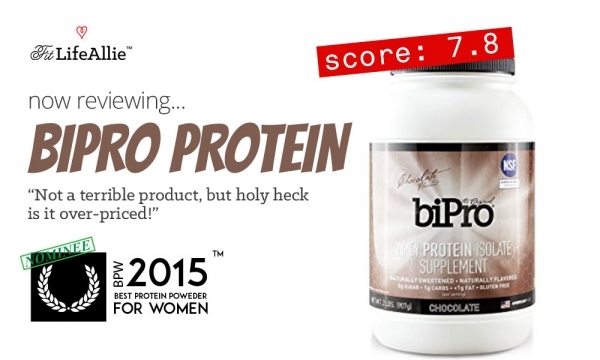 BiPro Protein Has a Simple Formulation. And that’s all. I’m having deja vu because there are several products I’ve tried that have this formula. But that’s what it boils down to. Nothin’ fancy. No artificial flavors or colors. It is dairy-based for all you vegan weirdos out there. JK you aren’t weird. I’m just jealous that I can’t live a happy life that doesn’t depend on the slaughtering of animals. Sigh. Okay let’s wrap up this BiPro review.